The new Kindle Fire tablet comes with 7-inch brilliant color-rich LCD display. What it can do ! It does not support Android Marketplace. AVI is not supported, you have to convert them. Painful, I know. Almost twice heavier than the Kindle 3, but still lighter than the Kindle DX. All Amazon content is stored in the cloud with no cost. No camera ! and No Microphone ! All Amazon contents, bookmarks, notes, highlights, even movies’ left-off points are automatically synchronized and stored in the cloud. It uses a fork of an old Android (probably earlier than 2.2). 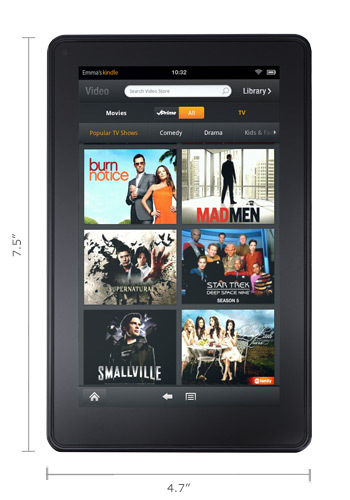 Kindle Fire is announced with really a low price tag. Compared to many tablets out there, I personally think it’s a great choice for someone who want a tablet but does not *need* an iPad. Remember that these tablets are Post-PC devices, as long as they let you surf the webs, listen to music, watch movies, read books, go on facebook and other social networking, they do the job. Also, Amazon’s ecosystem is strong, may or may not be stronger than Apple’s, but it’s strong enough to make Kindle Fire sales soar up sharply after it becomes available. Regarding its low price, it will also affect other tablets’ markets significantly. Frankly, I think the cause of other tablets’ failure is the ecosystem, and a bit because Android is too “open”. What I view is that now we have about 3 categories of tablets, iPad, other tablets, and Kindle Fire. Before Fire is announced. The “other tablets” are mostly run on Android. They mostly comes with rather high specifications. Their prices are around iPad or a bit lower. And that’s it. They simply can’t compete with what Apple can offer, both the looks you get when you’re holding an iPad and the feel when you’re in their ecosystem. Now that Fire’s out, it’s like, it has become a low-end choice for users, but with strong ecosystem, and it runs on comparatively closer and more stable Android. So, where the “other tablets” go from here? I believe at least in near future, we will see huge price drops for sure! Hands on video. See if you like how it looks, how it works.